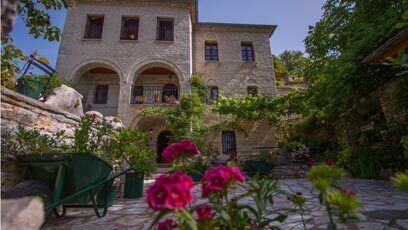 The imposing building of the Casa Calda guesthouse (warm house in Aromanian) rises in an idyllic setting. The mansion was built in 1864 by the merchant ancestors of the Bitsios family. The grand arches in the facade add plasticity and grace to the stone fort-like three-storey building. The scenery and the architecture that remain unchanged over the years, along with the warm hospitality, await our visitors to offer them a true oasis of picturesqueness, absolute tranquillity and a fairy-tale atmosphere. The three-storey stone building consists of 5 rooms on the first and second floor and the old cellar that has been transformed into a lounge. In our restaurant - café- "sweet" shop Sarika you can enjoy delicious stews, traditional pies, grilled meat, tsipouro with homemade snacks, spoon sweets, your coffee or drink, while relaxing by the fireplace with view to the peaks of Tzoumerka. Apart from tranquillity and relaxation, Sirako and the surrounding area of Tzoumerka offer the visitors many enjoyable activities during their stay.